In 2002, Martin Goetze and Stuart Dobbs cleaned and restored elements of the famous organ case at St Nicholas Stanford on Avon in Leicestershire. The church is vested in The Churches Conservation Trust https://www.visitchurches.org.uk/. 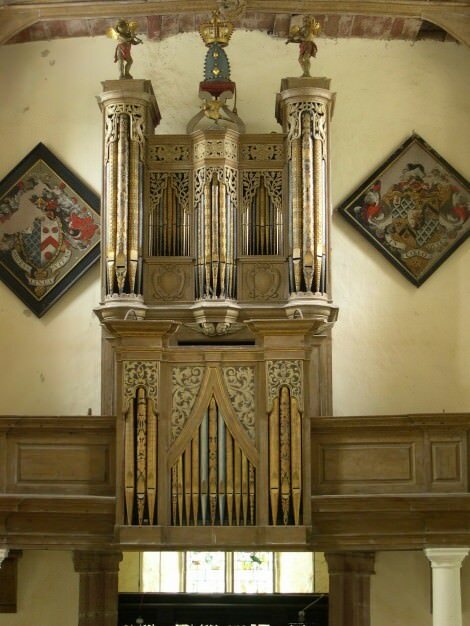 The organ is part of the instrument made by Thomas and Robert Dallam for Magdalen College, Oxford, in about 1631. In 1730 the organ house at Magdalen College was demolished, the main part of the organ being stored until 1737, when it was bought by the parishioners of Tewkesbury Abbey where it survives, having been rebuilt a number of times. The Chair organ was possibly rebuilt at Magdalen College for use in the chapel until the new organ was installed in 1736. This is the instrument that is now at Stanford on Avon. The work consisted of treating for woodworm and cleaning the organ of debris resulting from the church being restored and occasionally open to the elements during the last few years. Some of the work of the 1966 restoration was replaced. The heavy resin replacement carvings had fallen off, and were replaced with carved oak like the original, and the replacement embossed pipes, which hardly resembled the originals, were replaced with new. An example of the latter, a repair by Stuart Dobbs, is shown in the illustration.